Have you ever heard tornado sirens? They sounds like angels crying. And when the sky gets sickly green and the air gets still with storm, they begin to wail. When you hear them, it’s best to get inside, because a twister might be churning toward you. 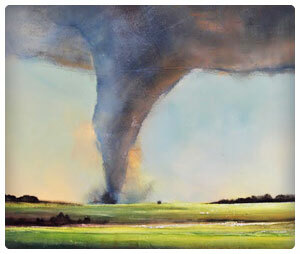 Tornadoes are some of the most terrifying natural disasters in the world. They can level whole neighborhoods and drive barbie dolls through tree trunks. If you’re moving somewhere that gets tornadoes, you should know what to do if you get caught in one. Here is our tornado survival guide. One can’t really prepare for a tornado. How do you prepare for a mile-high, home-exploding tunnel of wind? However, one can situate their home to increase their chance of survival. Cover area – Have a sturdy area where you can hide. Under a basement staircase is best. Second up is a sturdy wall without windows. Blankets – They’ll shield you from glass and splinters. Helmets – Bike helmets, football helmets – anything will do when billiard balls are flying around at 200 mph. Survival pack – Include a flashlight, water bottles, protein bars and bandages. Get inside – Get inside somewhere if at all possible, preferably to your designated tornado cover area. Cover – Cover yourself with everything you have (blankets, clothes, helmets), or at least get on your knees, duck your head down, and cover your head/neck with your arms. Wait – Don’t move until you are sure the tornado is gone. Then wait a few more minutes. Find safety – If the tornado trampled your home, the safest spot is probably outside. However, if you weren’t hit, stay inside and wait out the storm.